Like 7×7 wire core construction rope, our 7×19 wire core galvanized steel rope offers good protection against corrosion, however it is significantly more flexible than the 7×7 construction. It also has excellent fatigue resistance making it ideally suited to hoists, winch ropes and security cables. 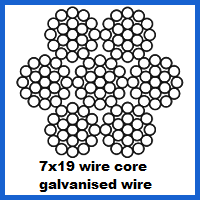 7×19 wire core galvanized steel rope construction is made up of 7 strands of 19 wires allowing it to provide the perfect combination of strength and flexibility. Whilst it is slightly stiffer than a 6×19 construction wire rope, it has increased resistance to crushing and is also less likely to deform when running around sheaves. Similarly, to our 7×7 wire core construction rope, 7 x 19 rope is often purchased in smaller diameters in order to maximise its flexibility. It is an ideal rope for running load or rigging applications where it is required to pass over pulleys and loads. We recommend that you do not use this rope for overhead lifting and make sure to never exceed the working load limit. This wire should also only run over wire sheaves, with a diameter no less than 14 or 15 times the diameter of the wire itself. The Min. Break force factor is K= 0.362. This is available in diameters from 3mm-16mm. This smaller diameter ropes in this construction are the most flexible typically the 3mm-6mm. The 7×19 is most commonly used with pulleys but also in a wide range of other applications including:- Garage door cables, gym equipment, control cables, wind turbines, wire-rope slings, whip checks, winch ropes and general engineering applications. Also available in theatre black for if you need a more unobtrusive looking wire, perhaps on stage sets. We can supply this rope construction in diameters from 2mm up to 16mm. If you would like more information on our 7×19 cable or alternative wire ropes suitable for hoisting and winching, please give us a call on 01384 78004 or alternatively you can contact Rope Services Direct via another method through our contact us page. 7x19 Wire Core Galvanized Steel Rope Overall rating: 5 out of 5 based on 6 reviews.